We now know that as far back as August 2011 there were rumblings of more “Star Wars” movies in the pipeline, and when Disney announced they would acquire Lucasfilm in October 2012, they made it official. Now, in an interview with USA Today, the maestro himself George Lucas revealed that he originally thought of developing “Episode VII” himself and release it in May 2015 before selling off the company. “It’s better for me to get out at the beginning of a new thing and I can just remove myself….The time is more important to me than the money,” he added. Lucas went on to note that his only regret about “Star Wars” is that he never got to experience it like the fans did, though he’ll get his wish with Star Wars: The Force Awakens. 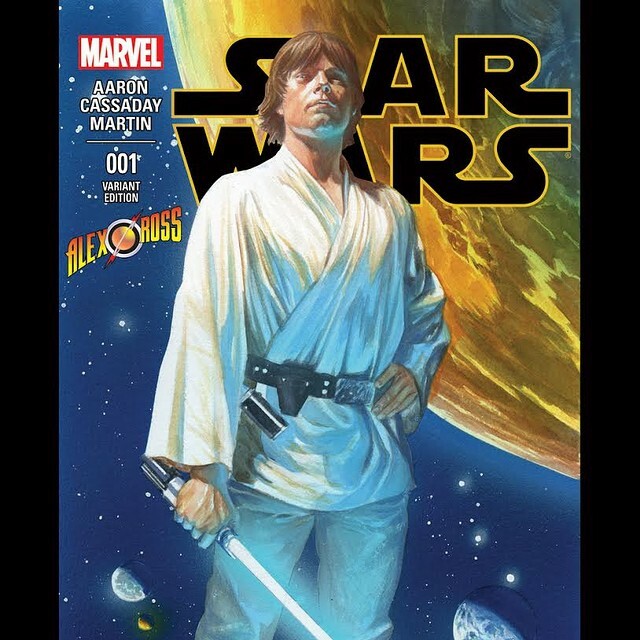 In other “Star Wars” news, Marvel Comics is set to publish issue #1 of their new ongoing “Star Wars” comic series tomorrow and fan-favorite artist Alex Ross has revealed his variant cover for the title. The cover will be available exclusively through AlexRossStore.com for $9.99 or a signed edition for $34.99 with just 3,000 total copies being printed. Star Wars #1 is written by Jason Aaron with art by John Cassaday and Star Wars: The Force Awakens will hit theaters on December 18, 2015.